Delicate double swag leg chain jewellery with elasticated top. Brighten up a pair of shorts, swimwear or a mini-dress with this delicate leg chain to add a finishing touch to your outfit. 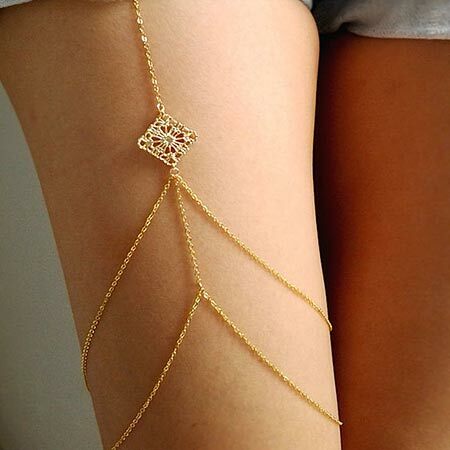 Leg jewellery is the big trend for this summer and this chain offers a double swag which hangs between the thigh and knee topped off with a diamond shape which lies mid-thigh. The gold chain is held in place by a 1cm wide elastic which sits at the very top of the leg.